I get it. It can be hard to put together all the different components you need for your nail art look! Colors, textures, glitter, studs... There's a lot to consider. 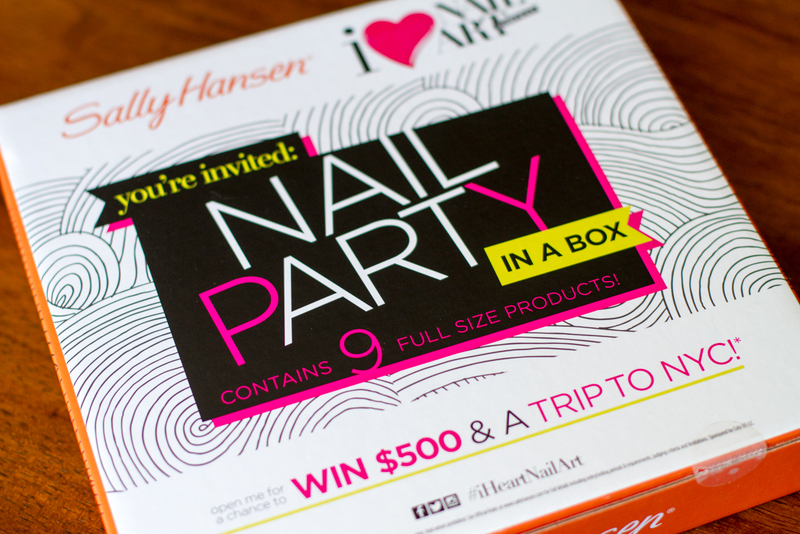 Sally Hansen gets it too, and they've put together this handy "Nail Art Party in a Box," which includes plenty of goodies for your next get together plus nail art designs to match. TWENTY (20) lucky readers will win this fun nail art kit, which isn't sold in stores! Read on for details and your chance to win! The box is filled with awesome. When you open it up, it has a couple of nail art tutorials printed on the inside of the lid. The tutorials use the products from inside the box, so you can easily recreate them if you'd like! Don't they look so cute, all snug in their spaces? Feeling inspired? Enter your nail art into the Sally Hansen I Heart Nail Art contest and you could win $500 plus a trip to NYC to compete in the grand finale! The winner of the grand finale will receive $2,000 and will act as a nail art ambassador for Sally Hansen. Hashtag #IHeartNailArt or visit sallyhansen.com to enter. No purchase necessary. See Official Rules for full details. Enter to win using the Rafflecopter widget below. Giveaway is open to US residents only and ends on 06/14/14 at 12:00am EST. Twenty (20) winners will be chosen and notified by email. If a winner does not respond within 48 hours, a new winner will be chosen to take their place. This giveaway is sponsored by Sally Hansen. Such a cute set! I would enter but sadly I'm from Canada. Best of luck to everyone else though. Sally Hansen is a brilliant polish, shame I can't buy it or enter the competition as I'm from the UK.... Good luck to everyone who can though! This is such a great idea. All the supplies in one great kit. I'd buy that. I love Sally Hansen polishes. Awesome idea! The kit looks fantastic! I wish I could win your nail art skills too, your talent is amazing! This kit is amazing and I'm dying to try the new color foil polishes!! !